From stroking grey whales to snorkelling with sea lions, there are plenty of wild adventures on this Mexican peninsula. British naturalist and eco-adventurer Catherine Capon shares five of the best. Cabo is known as a spring break destination for American students, but if you take a boat from there out into the Pacific Ocean or the Sea of Cortez, it’s one of the best places to see humpbacks from January to March. We saw them breaching, tail slapping and spyhopping (when the whale rises partially out of the water in a vertical position). Whale Watch Cabo put a hydrophone into the water so you can hear the male humpbacks singing — it changes every year and it’s absolutely mesmerizing. You can go diving there too and in the winter, thousands of mobula rays congregate in Cabo Pulmo Bay. So many people only stay in Cabo when visiting Baja California Sur, which is a shame. Just a two-hour drive up the road, there’s a city called La Paz. For me, it has two of the most amazing wildlife experiences. Los Islotesis an hour’s boat ride from the city and is teeming with a colony of sea lions. In fact, it is one of the best places to snorkel with them. The young pups are especially inquisitive — they swim up to you and nibble on your fins or snorkel mask, but they’re not agressive, they’re just being playful. One was even lying on its back, wanting its tummy stroked like a puppy dog. You just have to be careful when the alpha male is around — you can recognize him because he’ll be much bigger than the others and have a big lump on his head. You can also paddle board around some of the neighbouring islands and there’s a cargo ferry wreck called LA Salvatierra if you’re into diving. Just a 20-minute boat ride out of La Paz harbour will bring you up-close to the biggest fish in the ocean — the whale shark. Swimming with them is an incredible experience. It is safe to be in the water with them as they only eat plankton and fish, but when you get in the water, their size is overwhelming — they can grow up to 12.5 metres and weigh up to 21 tones. You can’t touch them because they are endangered, but you can swim right next to them and get some fantastic underwater shots on a GoPro. The picturesque town of Loreto is about a four-and-half hour drive from La Paz — it is a scenic journey (and you can stop for some tasty tacos en route). If you go in late February or early March, it’s one of the best places on the planet to see blue whales — aka the biggest animal on the planet. You can only get close to them on a boat because they are protected, but it’s an incredibly humbling experience. Loreto Blue Whales run tours, but also raise awareness and money to protect the great whales. Even if you don’t get to see them, there’s an abundance of marine life in the area, including common dolphins, rays, sea lions and pilot whales. The last stop is a five-hour drive north of Loreto. You’ll need a 4 x 4 to access Kuyima Ecotourism because you’re literally in the wilderness. The eco-resort runs on solar and wind power, so has no carbon footprint. The stars are amazing at night because there’s little light pollution. But it’s also the closest you’ll ever get to a grey whale. 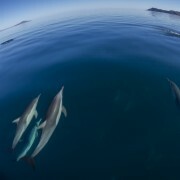 They come to the sheltered lagoon every year to give birth and will always swim up to boats to be stroked. No one really knows why — it might be because they like people scratching the barnacles off their skin or they just like the attention — but if you go out with a local fisherman, I can almost guarantee you’ll have a mother and calf next to you wanting to be touched. They are huge, but so friendly. It’s the only circumstance that I’d condone touching a wild animal. This article was originally published in BA Highlife Magazine.